The 4th installment of the Make Him Over Hunt starts today, and as usual, this hunt celebrates the guys. 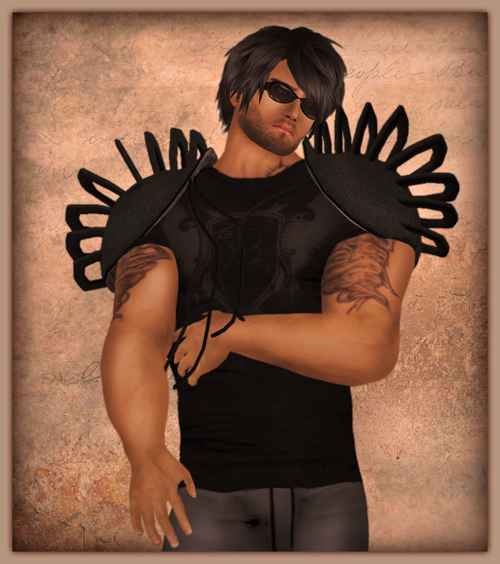 Gavin McGinnis is showing the free hunt gift by CheerNo, this rounded spiky shoulder armor that recalls a post-modern armadillo. Or, as Gavin put it, "I feel like the male Lady Gaga." Heh. Some free December glasses (the frames + glasses tint are color change), a $1L black T-shirt by KoQStar + some free gray leather pants (the MHOH gift by Wilson's Designs) completed this look. Gavin is also showing 1 of several free male poses (aptly entitled "Manly Man") by jasPOSE, that you don't even have to hunt for. Hints + a participating stores list on the Make Him Over Hunt 4 hunt blog here. Manly makeover love + fashionista kisses to all!